On this edition of "Get Rid of All The Food Before Our Trip! ", sweet potato and orange are the stars with supporting roles from fresh cilantro and parsley, as well as spicy chipotle sausage. It's a good one, and just look how pretty this soup is! I had a few potatoes I knew were aging a bit and a several oranges leftover from giant bag of clementines that we'd bought from Costco a couple weeks ago. When I delved into my trusty Flavor Bible, I found that they pair beautifully together! I was pretty psyched. Two plants with one stone, if you know what I mean. Though, I've never been much a fan of citrus, specifically orange, in my soup...this was darn delicious. It's funny, when the herbs are blended in, the soup becomes a bit frothy which I found to be delightfully amusing for unknown reasons. It did dissipate after a short while though. I decided to make a sweet potato soup after learning that boiling the sweet taters is actually by far the best method of cooking for retaining their nutritional prowess. Now usually I try to stay away from boiling vegetables because I had always thought the opposite was true. Apparently with sweet potatoes, boiling is actually best. Roasting, in fact, wrecked havoc on them in regards to retaining their nutrition. Boo that! If you want to learn more about the best way to cook sweet potatoes (trust me you do! ), check out this totally interesting video from the scientific, nutritional genius that is Dr. Michael Greger at Nutritionfacts.org. Do I get excessively excited by things like this? The answer is an emphatic yes. A creamy, sweet potato soup enlivened with fresh-squeezed orange juice that's complemented by green cilantro and parsley, and studded with browned Mexican chipotle sausage. Add the sliced sweet potato to a large pot. Pour in just enough water to cover the slices, add a dash of salt, and bring to a boil over high heat. Then, cover and boil for about 25 minutes.Meanwhile, in a large rimmed frying pan heat the olive oil over medium. Add the onion and garlic and saute for about 10 minutes, until the onions have browned.Juice the oranges and add the juice to a blender along with the broth, allspice, and pepper. Transfer the onions to the blender when they are done browning. Add the chopped sausage to the frying pan and brown for about 5 minutes. 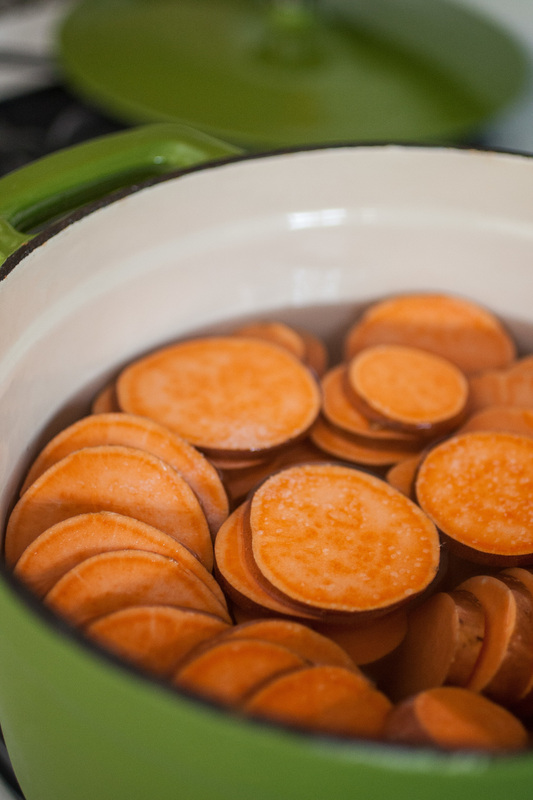 Once the sweet potatoes are done boiling, remove with a slotted spoon and place in the blender. Blend all the ingredients in the blender on high for several minutes until smooth and creamy, excluding the sausages and herbs.Now, add the herbs and blend until well incorporated. Heat in a high speed blender, or in a large soup pot until just heated through. You don't want to cook the fresh herbs. Serve hot and topped with 1-2 Tbsp. of the browned, chopped sausage and additional fresh herbs. 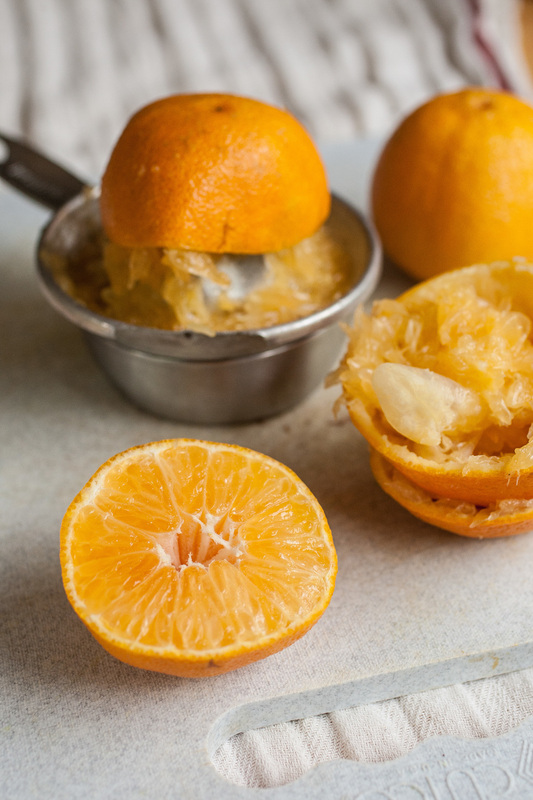 Orange juice --> Orangensaft (o-rongen-zahft) "Saft" means juice! This is a big one. Wool isn't really that cruel, right? "Investigations of sheep shearing found that workers in Australia, the world's top wool exporter, and the U.S. killed, beat, stomped on, kicked, mutilated, and threw sheep around as they sheared them." Wrong. Big time wrong. These sheep aren't pets, don't be fooled into thinking that just because they aren't slaughtered (which they usually are later) means they are treated as nicely as you'd treat your animal companion. They are nothing more than a commodity in the eyes of the wool business and if you think anything other than that...it's time to open your eyes and bring an end to blatant ignorance and apathy. Help ask J.Crew and Ralph Lauren to use cruelty-free materials in place of wool!